This season add ornamental grasses in your garden; they have so many uses. Whether you are looking for structure, whimsy, form, background, drought tolerance or color, grasses can provide great options in your landscape. Some grasses provide an upright habit while others may have a cascading weeping form. You will find grasses in all sizes from minis to giants sure to fit a variety of landscape styles in container gardens and small and large garden spaces. Many grasses have spike-like plumes; some with puffy plumes while others have an airy plume look. The plumes have a unique range of colors, as does the grass-like foliage. Plumes of black, white, grey, tan, brown, red, yellow, and even colors of cotton candy pink atop the foliage. Foliage colors of grasses range from shades of browns, reds, blues, greens, and my favorite, variegated in vertical or horizontal patterns. 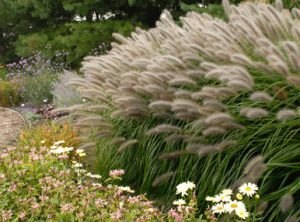 A few of my favorite grasses include: Miscanthus (‘Adiago’, ‘Strictus’, ‘Morning Light’, ‘Little Zebra’, ‘Super Stripe’); Pennisetum (‘Red Head’, ‘Hameln’, ‘Moudry’, ‘Cassian’, ‘Little Bunny’); Muhlenbergia (white or pink); Panicum (‘Heavy Metal’, ‘Shenandoah’, ‘Stipa’); Isolepis (‘Live Wires’); and Carex (yellow or cream variegated sedge). Happy gardening and may you add the element of grasses to your landscape this fall. Nelsa Cox is the owner and head horticulturist of The Garden Hut. She is passionate about plants and has worked in the retail garden center business since 1983 sharing her knowledge about what works best in our area. 919-552-0590. www.nelsasgardenhut.com.